IT WAS a moment of utter spine-tingling terror as the driver of the heavy freight train powering through Cambridgeshire looked back from his cab just after midnight and saw smoke and flames billowing from the leading wagon, just behind his engine. This was no ordinary payload. It was the week before D-Day almost exactly 70 years ago and the train’s 51 trucks were weighed down with a deadly cargo. On board were 400 tons of bombs, along with a panoply of fuses, detonators and primers. It was enough to blow an entire town to oblivion. Which it nearly did – if it hadn’t been for the heroism of two extraordinary men. At the controls of the locomotive on that fateful night were 41-year-old driver Ben Gimbert (pictured above) and his 22-year-old fireman Jim Nightall. The war was nearing its climax, and the bombs on board were destined for American air force bases in East Anglia, from where they would be used to pound German cities. The fast-dissolving spirits of the Nazi high command were at a low ebb at this late moment of the war and the Allied bomber commanders were piling on the pressure. The train crew, who like everyone else in Britain at the time could hardly wait for the conflict to end, knew precisely the lethal power of their high-explosive cargo. In seconds, Nightall had released the coupling, jumped back aboard and the two men were speeding their mobile fireball away from the town and into open country, with the flames lighting up the night sky all around. But they had barely travelled 140 yards when the earth reverberated with an almighty explosion. Jim Nightall was killed outright and Ben Gimbert, a huge man weighing more than 18 stone, was blasted two hundred yards away. But miraculously, although he was expected to die, he survived his injuries. 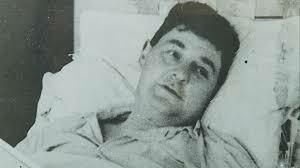 Thirty-two pieces of shrapnel and glass had entered his body and his lungs and eardrums had been damaged. Only seven minutes had elapsed since the men had first spotted the fire, when the 44 bombs on the flaming wagon – each weighing 500lb – exploded, reducing the station to rubble and blasting away walls, windows, roofs and doors for a vast distance around. The crater where the station had once stood was 15 feet deep and 66 feet across. But how much worse it could have been if the entire train had gone up. 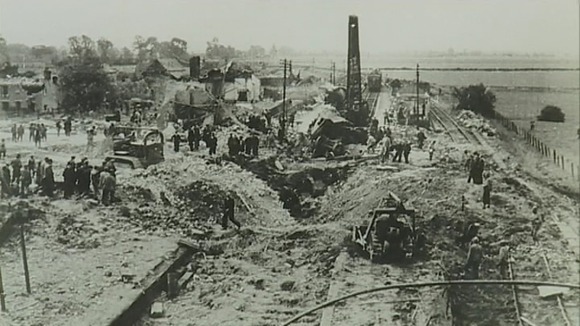 As it was, the Soham explosion (pictured above) was the biggest single blast in a British town during the entire war. In the pantheon of wartime heroism, the actions of two ordinary railwaymen in a rural backwater were as impressive in their own way as anything that took place on the front line. Quite justly, both men were awarded the George Cross (Nightall posthumously) for their outstanding act of gallantry. It is a reminder that unassuming railway staff like Ben and Jim were as essential to the narrative of war in their own quiet way as the “Few” of the Battle of Britain or the heroes of the Normandy beaches. It is a tale rarely acknowledged, but as Winston Churchill himself said, without the railways Britain could not have achieved victory in the greatest conflict the world has ever known. Dubbed “the fourth arm of the services” the railways were the lifeline of the nation. Without them, there would have been no evacuation of innocent children from the Blitzkreig on our cities, the British Expeditionary Force could not have been assembled and despatched. There would certainly have been no Dunkirk evacuation and no D-Day. Sadly, Ben Gimbert is now no longer with us, but some of his contemporaries – now in their eighties and nineties are still alive to tell the tale of their own heroism on “the lines behind the lines” as the railways were known during WW2. Now all in their late eighties and nineties, with their long lives nearing an end, I listened to the story of nearly a hundred of them, Their old bones may be frail now, but memory was undimmed as they revealed often for the first time and with crystal clarity, an astonishing story, of how they fought, not with guns and bombs, but with elbow grease and determination to keep the wheels of Britain turning. As the bombs rained down, brave train crews moved the coal for the nation’s furnaces as coastal shipping succumbed to the Luftwaffe and the Nazi U-Boats. The railway workshops built Spitfires, Lancasters, tanks, bombs and guns. Even when the trains were not running, the railways saved thousands of lives affording shelter to vulnerable London families who huddled on the platforms and tracks of the Tube stations as the bombs shattered neighbourhoods above. Railwaymen and women were so vital to the war effort that most were not allowed to enlist. Nearly 400 workers were killed at their posts and another 2,400 injured in the line of duty. Another 3,500 railwaymen and women died in military action. Even the locomotives were sometimes celebrated as heroes – an elderly Southern Railway locomotive is reputed to have brought down an enemy aircraft when its boiler exploded during the attack, causing the plane to crash. Among this “brave band of railwaymen and women” – a quiet and understated generation of folk now passing fast from us – I heard the courageous tales of Audrey Tallboys, 90 who worked heroically bringing the wounded home from the front on special ambulance trains. “But,” she told me, “I was sad they never allowed me to know the destinies of the tragic men for whom I cared.” And Alf Morris, who back in 1943, was the youngest survivor of the worst ever wartime disaster when 173 perished in a crush on the stairs to a bomb shelter at Bethnal Green Tube station in London’s East End. Another railwayman hero, 87-year-old Cyril Wycherley, still sprightly, told how he had jumped from the D-Day landing craft on Sword Beach. Skilled railway staff were vital in the assault – as well as the 10,000 extra trains, without which D-Day could not have happened, carrying everything from tins of triangular sausages to “Spuds” – vast pontoons for the invasion. With their men away at war, women everywhere rose to the challenge of keeping the nation moving – cleaning the engines, selling the tickets and even working as welders to repair the damaged tracks and trains. But there was no effort more magnificent than that of the army of ladies from the WVS who worked round the clock at wayside stations in Kent to feed and water the tens of thousands of dazed and weary troops who were brought home on a vast convoy of trains from Dover during the Dunkirk evacuation of June 1940. At each halt the women worked without sleep day and night making pies, sandwiches, hot chocolate and Horlicks – a feast which famished troops grabbed hungrily through the train windows At one station the women filled vats donated by a local brewery with water so the men could wash, offering haircuts and a welcome shave. Where there were longer breaks in the journey, the doughty women would marshall the men into reception centres, removing boots and socks revealing feet raw and bleeding. They washed their socks on a production line and handing them on when dried to the men on the next train through. No wonder the WVS organiser won the British Empire Medal. But it was the Blitz a few months later that brought out the true mettle of Britain’s railwaymen and women. No one could have been braver than the crew of the Flying Scotsman train was attacked in November 1941. They were speeding along the long, straight section of track where the line skirts the North Sea coast near Berwick, when they saw two planes approach out of the sea mist. The enginemen assumed them to be friendly and concentrated on the track ahead, speeding their passengers on to Edinburgh. They got a nasty shock when they saw over their shoulder that the planes had opened their bomb-doors and released a shower of bombs. Luckily, most of them fell wide, dropping into the waves. But the Germans weren’t giving up. They skimmed ferociously over the Scotsman, strafing the train with machine gun fire from end to end. Although the passengers were terrified, none of them was injured. But when the fireman looked down he saw that he had received a bullet through his left elbow. It had run down through his arm and emerged from his wrist. Heroically and obviously in great pain, he made light of the injury, continuing to stoke all the way to Edinburgh, shovelling hundredweights of coal in the process. On arrival, this hero of the tracks was taken exhausted to hospital in Edinburgh. But he was soon back at work. Unlike the fighting men, who often got long breaks from the combat, the train crews faced relentlessly the most incredible dangers in their jobs day-in, day-out. Even the humblest railwaymen displayed the most astonishing bravery. Norman Tunna, a shunter in Birkenhead goods yard by the Mersey docks, was the first railwayman on the home front during the war to be awarded the George Cross. In the Thomas the Tank Engine world of the pre-war railways, the job of shunter was not high in the pecking order. But during the war, all this changed. Crouching in the dark beneath heavy and unstable wagons, often in total blackout with bombs falling all around, demanded great skill and dexterity – as well as iron determination. It was such grit that turned Great Western Railway shunter Norman Tunna into a great war hero. Tunna, like many of his colleagues believed simply in getting on with the job, disregarding the bombs as he worked. One night in September 1940, during the seemingly continuous raids on the Liverpool docks, he discovered two incendiary enemy bombs blazing furiously in a wagon full of 250lb bombs. He raced to the engine to get a bucket of water to douse the blaze, but this time it was raging beyond anything a single bucket could deal with. One of the incendiaries was jammed tight between two high-explosive bombs in the wagon. With the coolest of nerves and at great risk to his own life, he picked it up and tossed it as far away from the other bombs as he could and continued to spray the bombs until the flames were doused. Had the entire train gone up, the consequences for the packed streets of Birkenhead would have been unthinkable. Tunna, a modest man, continued to marvel for the rest of his days that a humble shunter from a Merseyside terrace had been summoned to Buckingham Palace to receive one of the top bravery awards of the war. But amid the mayhem and disaster, there was hilarity, too. When a bomb plunged through the roof of Hull goods station, one unlucky railwayman swallowed his false teeth in a moment of shock. The foreman, who fortunately had once been a football referee and was experienced at dealing with minor injuries swiftly, decided that the best form of treatment was a clout across the back if the neck. Witnesses said they had never seen a set of gnashers travel with such velocity. Meanwhile a bomb at Birmingham Snow Hill scattered clothing all over the station, including an oversized pair of women’s cami-knickers which were sent sailing upwards to end up suspended on girders over Platform 5. One “serviceman” on the way back from Dunkirk was found to be a Frenchwoman, who was being smuggled home by a British soldier who he had married in a moment of passion and was “damned if he was going to leave her behind”. One of the greatest sources of good humour was Winston Churchill himself, who travelled everywhere in his own private train – a veritable hotel on wheels, complete with cooks, waitresses and secretaries. “Everyone is glad when Mr Churchill travels. He talks to everybody and knows all his train staff by name and probably how many children they have got and where they live,” one of his entourage said. “He’s always cracking a joke with people.” Once, as his train halted outside his signalbox, a signalman was heard through an open window jesting that the Prime Minister was getting better grub “than the likes of us”. Winston promptly sent his uniformed butler along the track with a delicious meal on a silver tray. It is tempting to wonder what Churchill would have made of the fact that in 2013, seven decades later, the Germans have taken over swathes of Britain’s railways. Deutsche Bahn, the German state rail operator, based in Berlin, is in charge of the Cross-Country and Chiltern Railways franchises – as well as running most of the local trains in Wales. Berlin has a stake, too, in the London Overground, whose trains run through the East End once reduced to rubble by the Luftwaffe. Yet another Deutsche Bahn company carries most of the UK’s rail freight. Our other wartime enemies the Japanese – in the form of the engineering firm Hitachi – have been chosen to build Britain’s next generation of high-speed passenger trains, while Siemens of Munich recently beat our own Derby works for the £1.4bn contract for new cross-London Thameslink trains – effectively extinguishing Britain as a great train-building power. Soon, under EU rules, German Inter-City Express trains will be running beneath the Channel – our one-time bastion against invasion – and arriving in that supreme symbol of Britishness – George Gilbert-Scott’s great Gothic St Pancras station. All the more important then, that, as we remember the 70th anniversary of D-Day [on June 6], with the last survivors of World War 2 soon to pass from us, we should continue to remember Ben, Jim, Alf, Audrey, Cyril, Norman and all those other modest heroes of the tracks, whose quiet bravery and sacrifice did do much to secure Britain’s freedom in her most difficult hour.